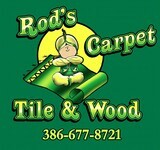 *Authorized Armstrong Dealer* Rod's Carpet, Tile & Wood is a family owned and operated business since 1969. We are the only exclusive Karistan Dealer in Volusia County. We offer a large selection of Area Rugs, Carpet, Laminate, LVT, Vinyl, Wood, Tile and Mosaics. Most of our installers have over 30 years experience with us. Contact us for a complimentary Consultation and Measure for your next design project. *Authorized Bona Certified Craftsman* Atlantic Hardwood is a Florida-native, family owned and operated business that has been serving Central Florida for over 30 years. We are fully licensed and insured contractors while being Bona-certified craftsman’s technicians. Come down and check out our 1000-square-foot showroom where we have various engineered hardwoods from Anderson, Bruce, Cala, Mannington, Robinson and much more. You can also check out the different gloss finishes and stains that we have right on our showroom floor! Voted "Best All Around" by our customers in both Volusia and Flagler Counties, our company is based on the belief that our customers' needs are of the utmost importance. Our entire team is committed to meeting those needs. As a result, a high percentage of our business is from repeat customers and referrals. We would welcome the opportunity to earn your trust and deliver you the best service in the flooring industry. Each of our team members have over 30 years local experience in flooring and take great pride in their workmanship! SCS Hardwood Floors, Inc. is a family owned and operated business. Allen Beverly, Sr. opened the first showroom in 1974 with the concept that quality is better than quantity. By the late 70’s, early 80’s hardwood floors became highly sought after and SCS quickly became the go to company for homeowners, business owners and builders. As the wood flooring industry evolved, so did SCS, maintaining the high quality of service provided to its customers. 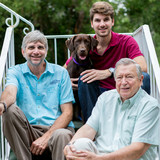 Today, Allen’s son, Leonard, owns and operates the business along with Terry Wagner, who manages and handles purchasing of over 75 manufacturers, and Adrian Pinheiro, who has over 15 years of installation experience; with the same concept that his father did…QUALITY is more important than quantity. Together they collectively have 50+ years of experience in dealing with wood flooring. SCS continues to follow the highest standards in the wood flooring industry today. We do not cut corners, over charge or try to sell you something that you do not need. We continually strive to bring you the finest options of wood flooring in the industry. We pride ourselves in our work and our craftsmanship. We strive to bring our customers a high quality product, quality craftsmanship and professional and friendly service, from the estimate to the completion of the project and beyond. Some of our clientele includes the likes of Walt Disney World, Universal Studios, Hard Rock (Tampa), local celebrity homes, custom builders and thousands of residential properties throughout the greater Orlando area. Serving all Central Florida Area, the Advanced Hardwood Floors team is the professionals to choose when it comes to flooring. Upon meeting our associate, you will immediately understand what makes Advanced Hardwood Floors different than the competition - it's our exceptional customer service. We take the time to listen to exactly what your needs and desires are and help you create the room or rooms you have been searching for! Aleem Flooring is owned by Ramza Aleem and has been in the flooring installation business since 1994 and continues to do quality flooring installations. Aleem Flooring is equipped for any type of wood and tile installation. You will find the type of installations that we have handled over the last 19 years of service to the Central Florida area, other areas in the state of Florida and previously in Western New York. Ramza co-owned the family flooring store in Buffalo, NY before moving back to Orlando in 1997. Since moving back to Orlando, Ramza has become Sales Manager of three flooring stores with two stores being national chain stores (Flooring America and Floor and Décor). We wish to always keep our customers comfortable and happy with our installation service therefore you will be glad to know that we are a licensed and insured company for your protection. Please take a look through our photo gallery so that you may be ensured of the type of quality service that we provide for every customer whether it be 100 square feet or 3,000 square feet that needs installation. We hope to hear from you soon. What kinds of services do hardwood flooring installation professionals in Ormond Beach, FL provide? Find hardwood floor experts in Ormond Beach, FL on Houzz. Search the Professionals section for Ormond Beach, FL hardwood flooring installers and dealers or browse Ormond Beach, FL photos of completed installations and look for the professional’s contact information.